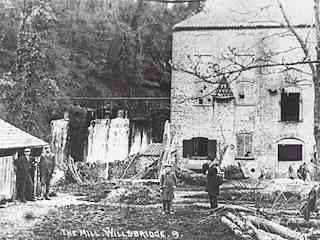 The Iron Mills at Wiilsbridge were erected on the site of the ancient manor house at Oldiand, on a stream called Mill Clack brook, which runs through the valley of Southernwood. As early as 1712 John Pearsall set them up for rolling iron, especially hoop iron, also for making steel. The works were successfully carried on by the family for many years. In 1801 Thomas Pearsall took out a Patent dated 30th December, for his invention in applying hoop iron for the construction of roofs, instead of timber, but it was a failure - a roof set up over the London Docks collapsed, and after that the works were discontinued. Relics of the old iron rafters, which were made at the mills, were found in several old cottages, only recently demolished. Mr. Pearsall retired to Bath, where he died in March 1825, The premises were sold in 1816, and the mill converted into a flour mill. 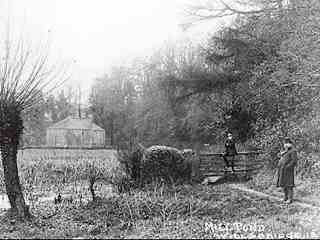 Pearsall made a dam across the brook to form a pond and mill head for his iron works, flooding the meadow and orchard called "Swans' Flat" Mr. Robert Lucas Pearsall was the last to leave the neighbourhood, and he resided at the Upper House before he retired to Germany, after having sold his estate to Robert Stratton Esq. Robert Pearsall was celebrated for his musical ability. He was born at Clifton, but the family and his ancestors lived at Willsbridge for many years prior to his birth. In 1800 to 1850, there was a stone quarry at Catscliffe, farther up the valley of Southernwood, and this was owned by a family named Caines. There are to this day flagstones which came out of this quarry, still to be found in some old houses in Longwell Green.